I consider my childhood bedroom – my first studio. There at the table is where I pretended to be, Kolchak the Night Stalker. 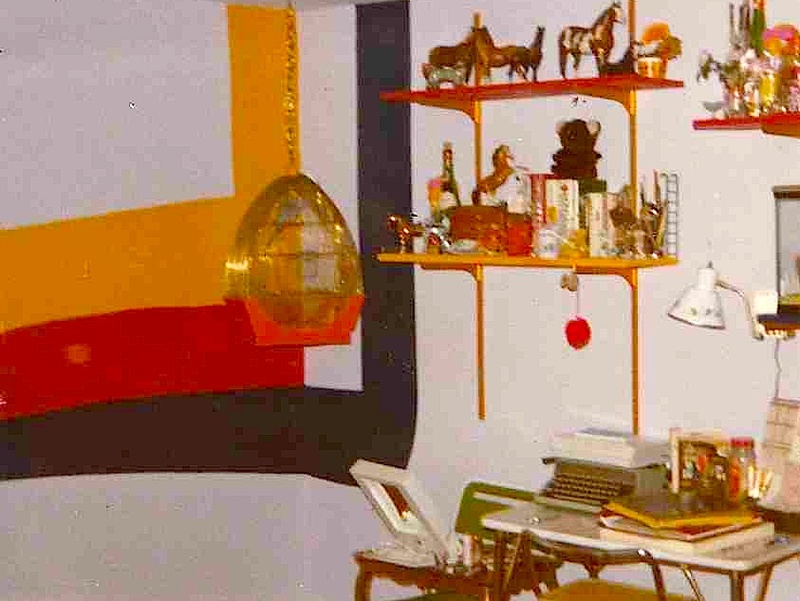 The wall “rainbow” was my first mural. I’d give anything to reclaim my original Breyer horses there on the shelf. My Clairol makeup mirror – geez, I’ll never get that close again to a magnifying mirror with lights, and my little budgie hanging in his little cage – I often let him fly around. Please pardon, but I’ve been back cleaning old posts. Many I’m not too pleased with, so I’m reworking these older writing pieces while the brain currently in my possession is on vacation. This entry was posted in My Art & Writing and tagged anxiety, art, books, children, entertainment, humor, insanity, life, memories, musing, photos, prose, publishing, scheduling, thoughts, writing. Bookmark the permalink. You know, I really like this. I like the way the stanzas bounce around on the “page” (screen), just the way a mind does, and I like the insistent yet frazzled voice. The presentation and message very much mirrors how most of us move through a day. How is my beautiful my AnnMarie friend doing today? My sleep has been completely off I didn’t get to bed til 9am slept until 730pm. I wrote a lot of my new book good story. We need to add some ‘AnnMarie’ in it. Maybe plug AnnMarie’s new book ‘For The Love of the monster’. Hope you are a beautiful day. Keep creating I can’t wait for AnnMarie book number 2!